Saturday's clear skies over nearly the entire state....you won't see this again soon! After Saturday's spectacular sun and warmth, we have returned to normal again. Saturday was warmest day for the region so far this year, with temperatures climbing into the mid to upper 60s for most western WA locations away from the water. As expected some of the warmest temperatures were east of the Cascade foothills, where compressional heating from descending easterly flow and distance from the cold water allowed a boost into the lower 70s. North Bend, WA got to 71F for example. Looking at the latest forecast model output, I am afraid that we have showers and cooler weather ahead of us this week. Through April 20th, April temperatures for many observing sites (e.g., Sea-Tac) have been on the coldest on record--since roughly 1950. This is also true looking at the air temperatures approaching our region aloft in the lower atmosphere (850 mb--roughly 5000 ft--at Forks on the NW WA coast). Thus, by any measure this has been an unusually cold spring. What does this all mean? What are the trends? Will moss take over our lawns forever? Several of you have complained that springs are getting worse lately--La Nina or not. So in this blog, lets look at some facts. 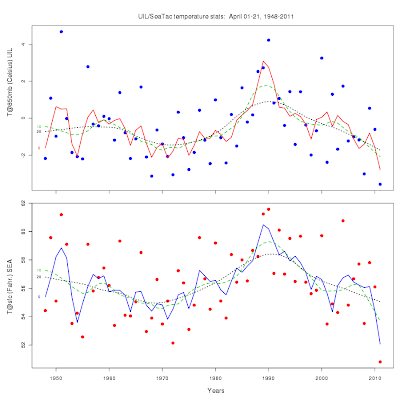 Here is a two-plot panel showing the trend in April temperatures in the lower atmosphere (mainly Forks, 5000 ft) and at Sea-Tac for the surface since 1948 (click to enlarge). The dots are the annual values and the other lines are curves fit to these variations with various degrees of smoothing. One is struck by the similarity of the long-term temperature changes in these two plots-- temperatures seemed to peak around 1990 and have cooled since. Temperatures were cooler in the early 70s back into the 60s. Some researchers have suggested there is a multi-decadal variation in the atmospheric circulation over the eastern Pacific (period roughly 30 years) and have termed it the Pacific Decadal Oscillation (PDO for short). This oscillation influences temperature and snowpack over the NW. UW scientists (like Nate Mantua) have led the study of this feature and have even plotted values of a PDO index, shown in the figure below. 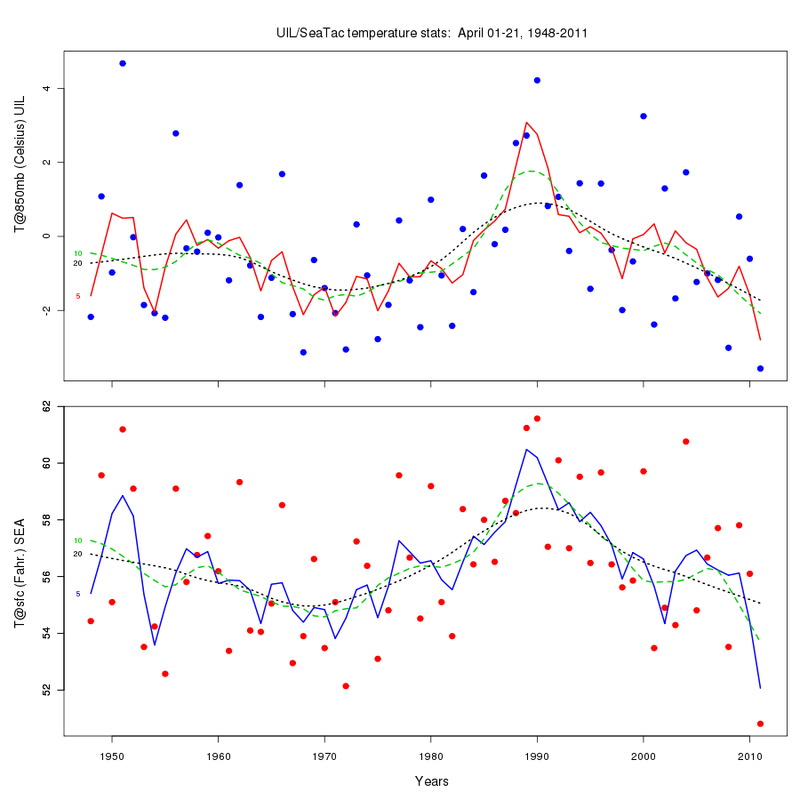 Blue (negative values) indicate cold PDO (and generally colder and snowier over the NW), and red is warmer. According to this index, the PDO was associated with colder temperatures into the 50s into the mid-70s, and then began a warm-up phase. More recently, it looks like we may have headed back into a cold-phase PDO. The trouble with this is that data before 1900 is really not good enough to tell whether this oscillation is robust over a long period and we really don't understand why it exists--just that there appears to be a natural mode of variation that predates any possible global warming forcing. As I have noted before, because of our position downstream of the Pacific, global warming will be weaker and start slower around here compared to most of the globe. (1) It is clear from the above information and others, that the region has cooled the past few years during the spring. You are not crazy thinking things are getting worse. (2) Such cooling is consistent with us going into a negative (cool) phase of the PDO. (3) Natural variability like the PDO is probably dominant around here at this point in time...far more significant than any global warming signal. (4) Eventually the PDO will switch into the warm phase and the global warming signal here will get stronger....so don't throw out your tee shirts yet. It is going to get warmer. And one final note...the return to last week's pattern implies not only that we will go back to cool and wet weather, but the eastern part of the U.S. may be on tap to experience more savage storms. In fact, the computer models are predicting this. Are Northwest Springs Getting Worse? Convergence Zone Snow in April!